Blush — Free Makeup Samples and Weekly Tips — from Makeup Chick! Smile big for those pretty pink cheeks! I’m talking about blush of course. The easiest way to put blush on in the right spot is to smile. When you smile you can see that your cheeks get big and round, how pretty! Use a big brush with the blush on it and just brush it over your cheeks. Start at the edge of your cheek that is closest to your nose and swoosh it toward about an inch or two in front of your ear. Make sure most of the color is on your cheeks and not the side of your face. To pick the right color just look in a mirror and decide what your skin tone is, light, fair, medium, olive, tan, brown, dark brown, or black. Then decide what color cheeks would stand out on your face without drawing all of the attention away from your eyes and lips. Your cheeks should be a subtle beauty, but there are many ways to add to that beauty. To get defined cheekbones, smile put a hint of lightly colored bronzer in a ” U ” shape framing the bottom side of your cheeks. You can also add a hint of highlighter on the top side of your cheeks. Apply the blush last if you are adding in these extra steps. Make sure it is all very blended! Flawless skin is the first step to beautiful, but even the loveliest of ladies can use some help from time to time. The look of perfect skin beings with a good foundation, preferably one containing vitamins, antioxidants, and SPF, topped with a loose powder. In order to create a more defined face, sweep a blush right under your brow bone. Brushing a soft peach blush lightly on cheeks will soften your look and help play up the intensity of eyes and lips, while a soft pink blush high on the cheekbones will give you a finished and youthful glow. Bronzers are also a great option for defining the face and creating a glow, but be sure to blend them well to avoid a hardened and streaky look. Cream blush should be used sparingly, but with the right application on the apples of the cheeks and the brow bone, you can create a youthful glow that will last throughout the day. If you’ve ever gone out and seen a girl who looked like she was stuck in constant embarrassment, or seen someone who looked like they were sunburned only across their cheeks, you’ve probably seen someone who violated the blush rule. What is the blush rule? Well, there isn’t one technically, but if there was, it would say that there is such a thing as too much. Blush in any color can look amazing, from the lightest to the darkest. What makes it look like too much is the way you apply it, how much you put on, and where you put it. I don’t know about you, but I don’t want to look like I have clown cheeks when I head out! When you start to apply your blush, keep in mind to only use small amounts at a time. In a circular motion, and this is where it is really helpful to have a kabuki brush!, lightly put it onto the balls of your cheeks. Smiling really big can often help you figure out where this area is. Try to keep it light, but visible. Take a bit of extra powder and lightly dust it across the bridge of your nose, going either left to right or right to left. It will help add to that sun-kissed look that so many girls want! Blush is hard to get the hang of, so the best thing you can do is experiment with it and with different shades. It’ll be hard at first, but after the first few times, you’ll get better at it and be able to do it really fast! If you have a short period of time between work and a party or just can’t quite take the time to completely redo your makeup, don’t worry! Turning your daytime look into a night-time look is surprisingly easy, once you get the hang of it. It is almost entirely in the eyes. First, you need to pick out an eyeshadow that is just a few shades darker than the one you wore during the day. Don’t switch to another color, that would add an extra step! Brush it on in thin layers, until you achieve the darkness you prefer. A tiny bit of dark eyeliner smudged underneath your eyes (and just a tiny bit!) will help add to the dramatic transformation. Next, add a fresh layer of mascara to your lashes, and a bit of color to your lips. That’s it! In three easy steps, you have successfully turned an everyday look into a gorgeous dramatic one. Time to hit the clubs; have fun! My daily makeup routine includes Almay Powder Blush. I use “pink” number 140. It seems to be the color that is best suited for me, and I have had trouble finding similar colors in other brands. This has resulted in me using this for a long time. Recently when I did finally locate some after having trouble, I bought 3 packs of it so that it would last me a long time before I had that trouble again! This blush does not have that shimmery look to it, which I hate. I don’t like a shimmery blush because it tends to accentuate my wrinkles (I know! I can’t believe I am admitting I have wrinkles!!). It is also not overly scented like a lot of other blushers. If there’s one thing I can’t stand, it’s highly scented makeup which conflicts with the scents I actually want to wear. It blends easily and looks very natural. I often use it to add a little color just under my brow area as well, so that I don’t look so pale. It doesn’t last as long as an “all day” type blush would last, but I find that it blends better than the cream blushers do, which definitely meets my needs. The application brush is a little small for my needs though, so I usually use one of my nice long-handled brushes to apply it. Sometimes when applying makeup, we aren’t getting the look that we want. You need a variety of makeup brushes that will help you achieve your goal. There are fluff brushes, angled brushes, shadow brushes and even bronzer or blush brushes. 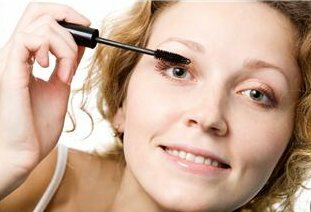 Be sure to tap off any excess makeup before applying it to your skin, when using just about any brush. Brushes with natural horsehair or other natural hair instead of artificial bristles tend to hold onto the hairs better and shed less. The tips should be soft and very flexible. Brushes are a good investment because you will use them for many years if you take care of them and keep them clean. They will be worth their weight in gold and you will more than get your money’s worth. A local beauty supply store, or even the grocery store may have brushes that will suit your needs.